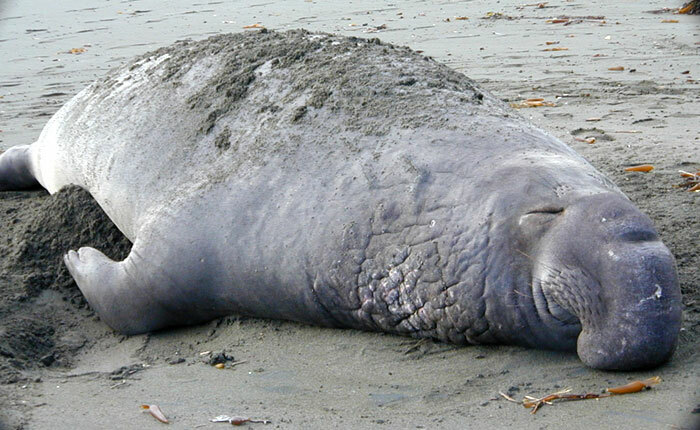 Having one of the most spectacularly visual (to humans) reproductive habits of all the marine mammals, the elephant seal reproduces during winter. Every year they migrate back to the beaches where they were born (and where they molt during the summer). 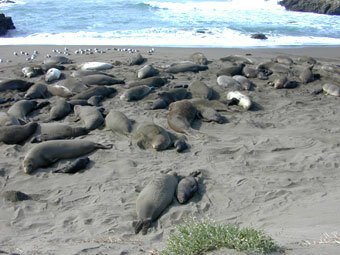 During reproduction, these beaches are called rookeries. 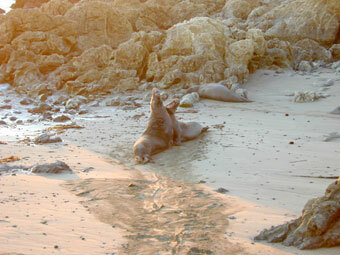 The males arrive first, hauling out on the beaches and establishing territories. The mature males (those with the proboscis and cornified chest) are called the "alpha" males and establish the best and largest territories. 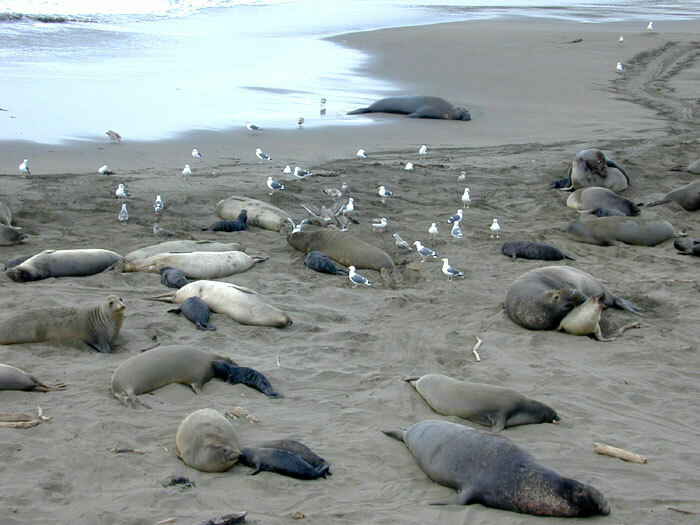 Early in the season the alpha males may spread apart easily but as the season progresses there is rarely enough room on the beach for all the mature males and fighting takes place to establish the strongest alpha males as the "beachmasters" (harem masters). 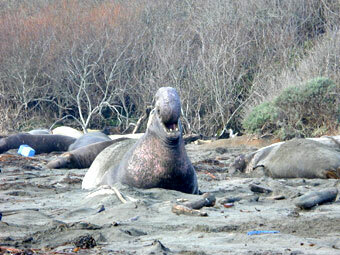 Elephant seal males fight with threats, vocalizations, and lunging to establish their territory. A threat is when a male raises up on his front flippers. This is followed by vocalizing into the proboscis. Subordinate males will immediately lie down and thus a hierarchy is established. If two alpha males are in the same area and do not move apart with the vocalized threats then they will physically fight by lunging at each other, using their cornified chests as a protective shield. This may result in blood-shed but rarely results in any real physical damage. Eventually one animal will give up, lie down and move away from the "winner's" territory. 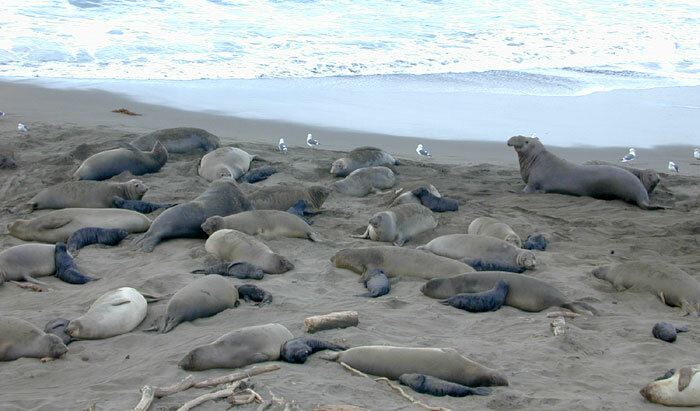 After a period of approximately a month the alpha males are spaced across the beach (now called a rookery) according to their ability to maintain their territory. 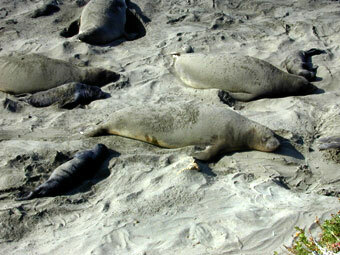 Subadult males may be on the beach as long as they are submissive and stay lying down. Weaker males are pushed to the edges of the rookery. Juvenile males arrive with the alpha males and practice fighting in mock battles. These practice fights rarely end in any injuries and are usually short. Notice that these males lack the fully grown proboscis and the cornified chest. The females begin to arrive as the territories are establishing. Some arrive early in the midst of the fighting but most arrive after the territories are well established. Once an alpha male has his territory defined and females start arriving he will not leave the beach even to feed (it may be several months). At the height of the breeding season a strong alpha male may have a harem of a dozen or more females surrounding him and with whom he will mate. 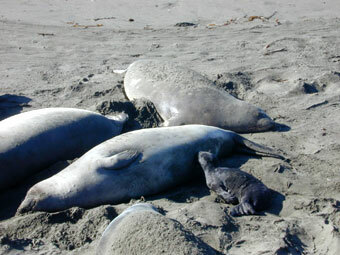 After giving birth, the females will remain on the beach with their pup for three to five weeks. Pups are born right on the beach. There is little warning of a birth as the expectant mothers are just lying around in their harems. The first announcement of a birth is usually a group of sea gulls that almost instantly fly to the new birth and eat the afterbirth. Newborn pups are easily distinguished from older pups, not only by their smaller size, but also, by the fact that they have 'fetal folds,' creases along their sides from being curled up in their mother's womb. 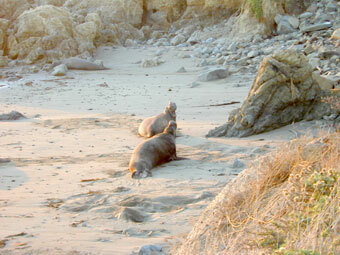 Most of the pups are born during a period of a week or two but some pups are born early in the season. 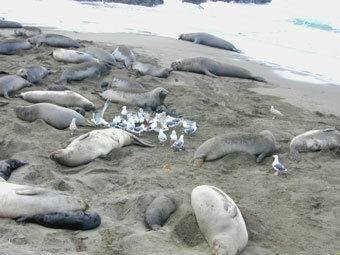 A flock of gulls often announces an elephant seal birth. The gulls flock to a newly born baby within seconds and attack the afterbirth on the beach. 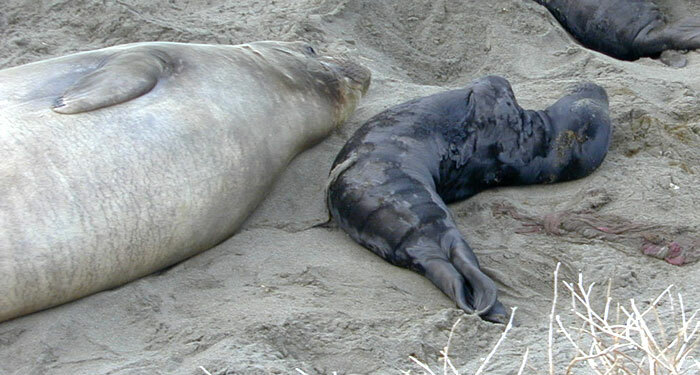 The mother will then move around to face her baby, vocalize with it (they bond vocally) and defend it from nearby animals. Pups will nurse for three to five weeks after their birth. 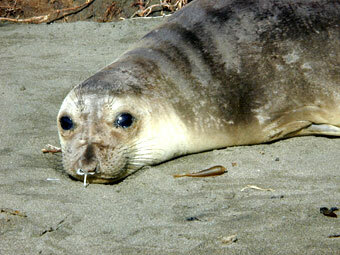 Elephant seals have extremely rich milk and the babies gain weight daily. The milk is very thick, similar to pudding. If a colony is disturbed (by an airplane swooping down or people scaring them) during the time babies are on the beach, the adults may be so afraid that they race to the water and may accidentally squish and kill the babies. 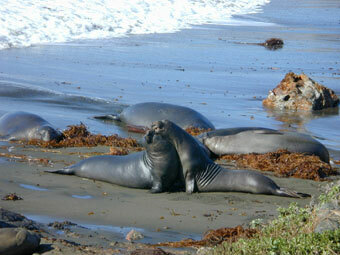 In the United States there are strict laws against disturbing any marine mammals so this rarely happens. 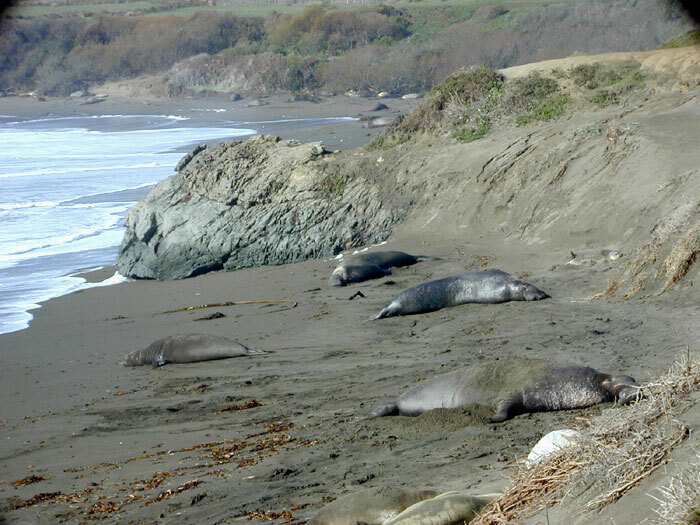 In fact, some of the rookery areas are right next to highways and humans hiking along the cliff-tops seem to have almost no impact on the Elephant Seals. 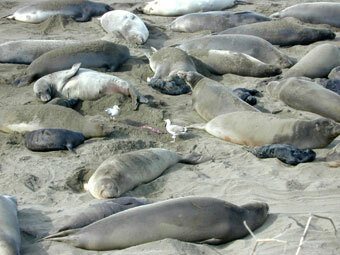 Babies may also be trampled when the males begin mating with their harem. 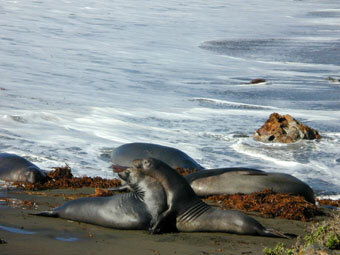 Mating occurs about three weeks after females give birth. 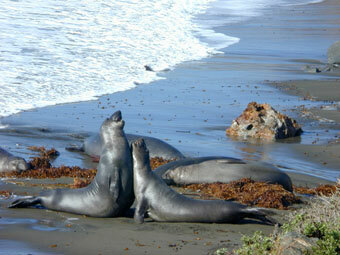 They will mate with the male who has defended their harem from attack by other males during the nursing period. 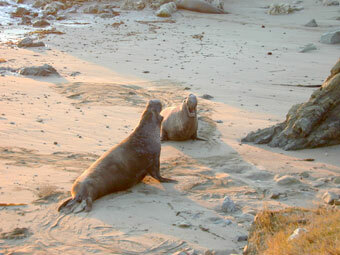 The mating is often very loud as the females bark when the male bites their neck and pins them down. 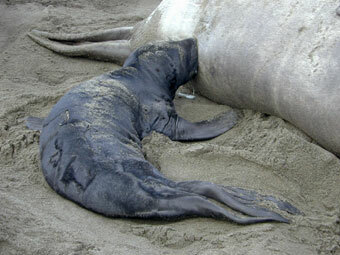 After mating the females will leave the beach, thus weaning their baby. They will swim far out to sea to eat. 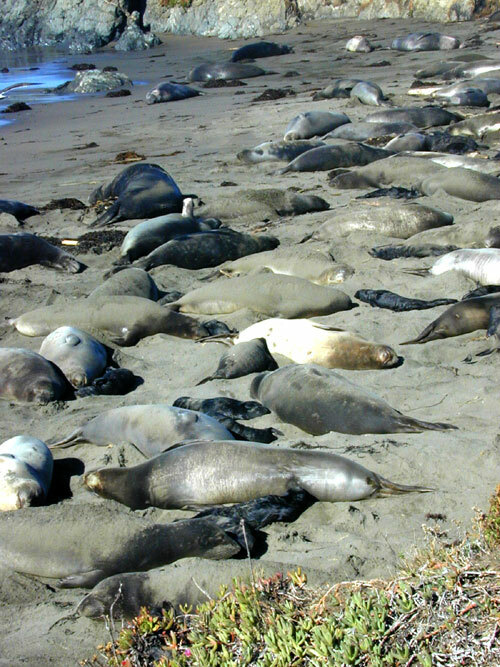 Many pinnipeds have 'delayed implantation' which assures a yearly reproductive routine no matter what the gestation period is. 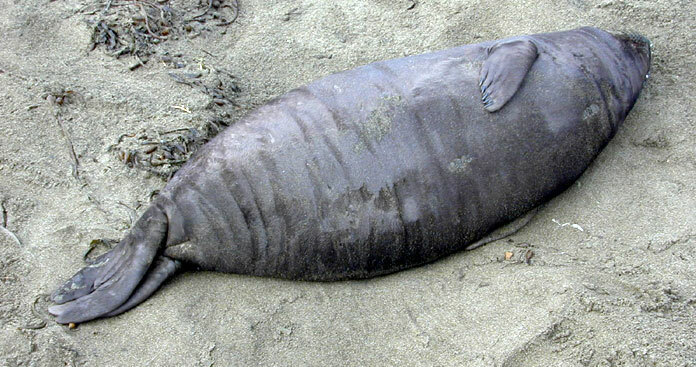 Elephant seals have this delayed implantation which means that no matter when the females mate (early or late in the season) the fertilized egg does not implant and begin development until the fetus will be full term the next winter. This allows a lot of flexibility for mating times and means that most babies will be born within a few weeks of each other the next year - on the beach, after the harems are established. Sneaker males hang out along the periphery of the rookery and try to mate when the harem master is asleep or busy. 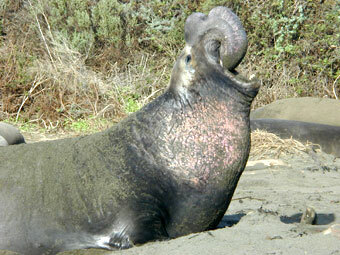 It is believed that only about one percent of all male elephant seals actually get to mate during their life. Males have a very hard life and live a considerably shorter time than the females. 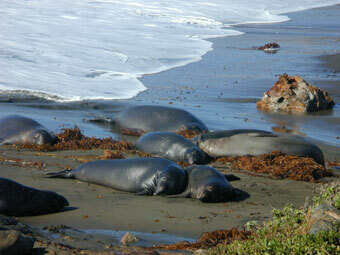 The babies left on the beach are very fat. 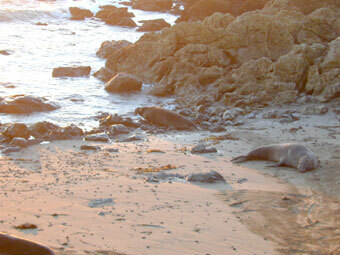 They are often called "weaners" and may lay around on the beach for a month or so until they get hungry. 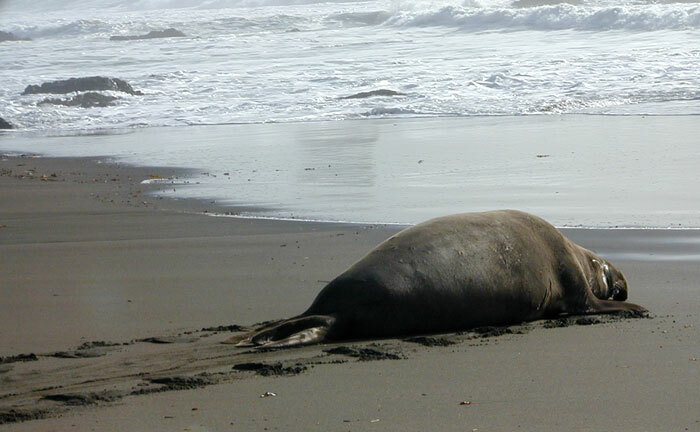 At the end of the reproductive season (about two months after it began with the arrival of the males), all of the adults leave and it is only the weaners left on the beach. 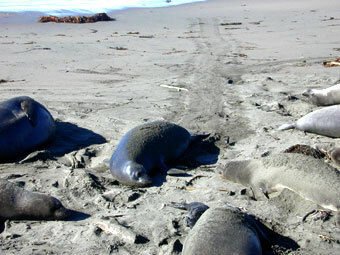 Then the weaners take to the sea to feed and the beach is empty … until the animals return the next summer to molt.